Come and experience JOY THRU MOVEMENT. It is easy to learn and does not require physical fitness or coordination. See how this "Moving Meditation" can easily be done by anyone, regardless of age or physical condition! Tai Chi Chih is 19 seperate mvoes and one pose. 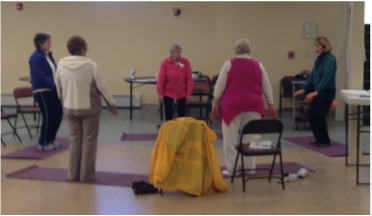 Participants will learn 10 simple movements during the six week class. It is not a martial art. It is completely non-violent and is practiced for its many health benefits. It is easy to learn and does not require physical fitness or coordination. Movements can be adapted for physical limitations and for being seated. Come and discover how Tai Chi Chih can benefit you!